Look at your facility. Is there overspray on work tables, the floor, the walls, or on tools? The adhesive you see there is adhesive you bought simply to spray it on your assets. You will never make a profit on overspray. Spray adhesive is almost never applied at precisely the right rate. Every bit of extra adhesive your staff applies is money down the drain. Many adhesives require time to dry. Time is money, and so is the square footage you dedicate to curing. Wouldn’t it be nice to eliminate cure time? How many hours does your team dedicate to cleaning adhesive from tools, tables, walls, and the floor? Would you like to eliminate that labor cost? You may use water to clean adhesive, and in today’s environmentally conscious world you risk costly fines if you dispose of that water down the drain. To avoid these fines, you need to pay wastewater disposal specialists. . . or eliminate the need for water-based cleaning of adhesive waste. Here’s something to think about: every time you use spray contact adhesive to bond a laminate to a substrate, you apply adhesive to both materials. That means you are using twice the amount of adhesive that you would consume using hot melt film adhesive. Why pay for two applications when you only need one? Uneven spray application generates uneven quality output levels and changing environmental factors (temperature, humidity) can alter cure times. What is the cost of that unpredictable output? What if you could use an adhesive that provides predictable, consistent, uniform coverage? Spray adhesives require costly ventilation systems during application and curing. Wouldn’t it be nice to use an adhesive with no fumes, no VOC’s, that is environmentally responsible? 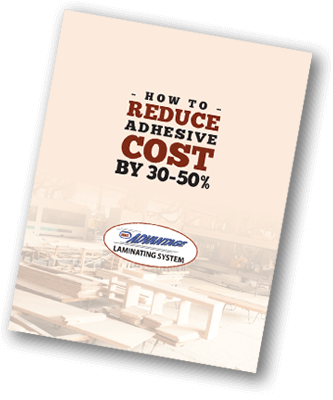 Add up the cost of these 8 cost areas and you will most likely see how easy it is to reduce your adhesive cost by 30% or more if you could eliminate them. 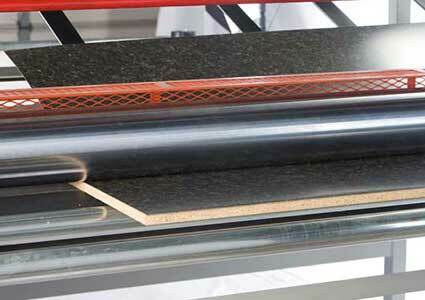 HMT’s Advantage Laminating System eliminates all 8 of the above hidden costs. No more waiting for glue to dry, no more clean up, no more uneven adhesive applications, no more half-cured panels scattered throughout your shop. Our cost-effective Advantage Laminating System adheres a surprising variety of sheet or roll stock laminates using high performance hot melt film adhesive. Laminate unlimited lengths in widths from 2″ to 61″ (10cm to 155cm) wide. The Advantage’s drive system feeds laminates, substrates, and eco-friendly hot melt film through the infrared heater and compression rollers. Your laminated panel is ready for immediate fabrication. See a laminator in action in the following video, or schedule a visit to our Chicago-area facility to see it in person. Alternatively, let us run a sample of your material through our industrial laminator equipment so you can inspect the resulting bond when we ship the sample to you. Request a sample today!